Try making this sweet, cool and refreshing dessert for a special day, such as Mother's Day. Your efforts will be so appreciated and you'll get many compliments on this fancy but quite easy to make dessert. Whip the yolks with 3 tablespoons of sugar in a bowl, and set aside. Whip the egg whites until fluffy in a large bowl, and gradually add 5 tablespoons sugar, continuing to beat until stiff peaks form. Whip the cream to soft peaks. Fold all the ingredients together, along with the zest. 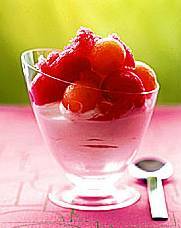 Fill six goblets halfway with the parfait, and place in the freezer for 2 to 3 hours. Using a small melon baller, scoop 2 cups of balls from each melon, and set aside. Cut out the remaining cantaloupe flesh, and purée with sugar to taste, to make about 1/2 cup. Pour the purée into a shallow container, and freeze. Cut the remaining watermelon into chunks, strain the juice from them, place the juice in a container, and freeze. Scrape the frozen melon mixtures with a spoon or fork to form granules of melon ice. Arrange the melon balls over the parfait, and top with the ice granules.